Etosha National Park is the highlight of your safari holiday in Namibia. Accommodation is available inside of Etosha or at the numerous lodges, tented camps or camping sites just outside of Etosha. Day trips to Etosha are popular activities - spend the day viewing incredible game – see huge elephants, lions and rhinos. Grootfontein is well located for travelers to overnight that are on their way to the Kavango (Rundu) or Zambezi (Caprivi). Book your accommodation directly and save. Lodge and guest farm accommodation as well as camping sites. Kalkfeld is situated in Northern Namibia in the Otjozondjupa region. Self-drive tourists that are traveling from Swakopmund to Etosha will often use the main road that passes Kalkfeld. Accommodation at lodges & camping sites are available near the famous Okonjati Game Reserve. Activities include game viewing, rhino tracking and visiting the dinosaur footprints. The village of Kamanjab is located in Northern Namibia and is well situated for travelers that are traveling to Etosha, Damaraland, Kunene and the Skeleton Coast. Accommodation in Kamanjab consists of comfortable lodges, affordable rest camps and camping sites. Activities include a visit to a Himba Village and Peet Albert’s Rock Engravings. Ongwediva is located in Owamboland and is a town in the Oshana Region in the north of Namibia. It is the district capital of the Ongwediva electoral constituency. 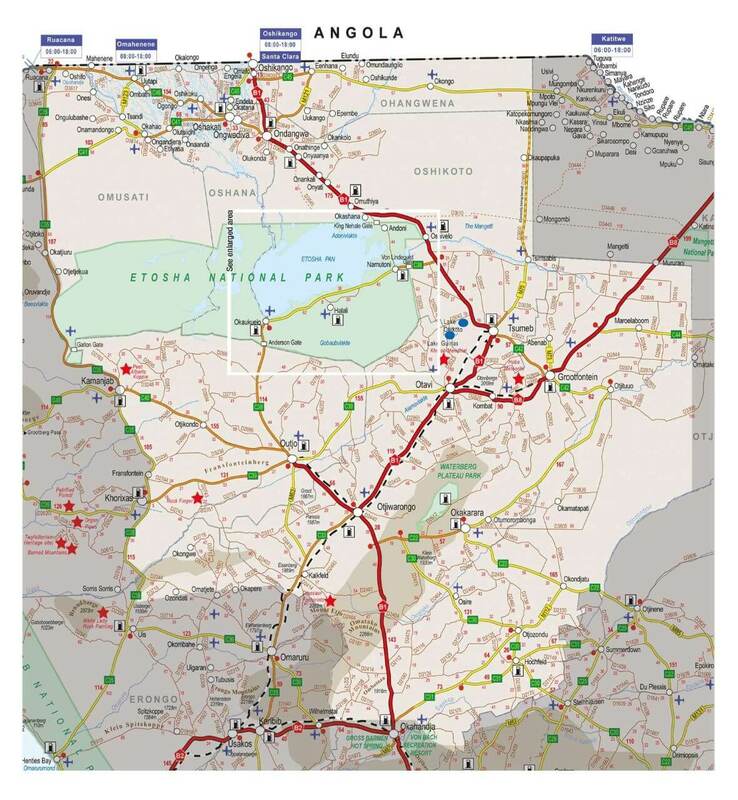 It is about 700 km's from the City of Windhoek and the closest major airport to Ongwediva is Ondangwa Airport. Otavi is located in Northern Namibia and many tourists on their self-drive safari to Namibia seek accommodation here. It is ideally placed for travelers heading to the Eastern side (Von Lindequist Gate) of Etosha or that plan to travel to the Kavango & Zambezi regions. The Otavi Mountains is one of Namibia’s most fascinating and diverse areas – game such as eland and mountain zebra roam the slopes and valleys. Otjiwarongo is a large town by Namibian standards and is centrally located in the Northern region. Accommodation is available within the town itself or the surrounding area. Travelers staying in this area are well placed for day trips to the Waterberg Plateau Park. Visitors are encouraged to visit one of the two Big Cat foundations. Accommodation in Outjo is available at various lodges, guest farms and camping sites. Book your holiday accommodation in Outjo and take day trips to Etosha. Book direct and SAVE! Accommodation in Tsumeb is available at hotels & guest houses. Tsumeb is only just over one hour’s drive from the Von Lindequist Gate Etosha. Tsumeb accommodation is popular with travelers that require accommodation between Etosha and the Kavango/Zambezi (Caprivi). The Waterberg Plateau Park in Northern Namibia is a popular destination and an ideal stop between Windhoek and Etosha or the Zambezi (Caprivi). Accommodation in the Waterberg Park region consists of lodges, guest farms and camping with free Wi-Fi. Activities include hiking, game viewing and rhino tracking.